NOTE: The image displayed above may show our logo/website, text or watermark. This will not appear on the finished print that we send you. Our photographic prints are available in two sizes and are developed onto a fine quality photo paper. These highly modern and stunningly attractive display items feature your print mounted to the rear of a piece of 5mm acrylic with aluminium stand-off fixing studs (included). 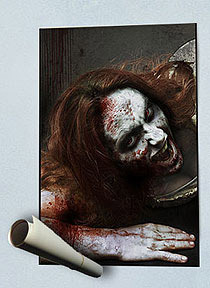 Our poster prints come rolled up in a tube and are printed in vibrant colours onto a high quality poster paper. The best of the best! Fine art prints meet all contemporary Giclée standards meaning the very finest paper stock, inks and processing, and are the exact same quality as you find in the best galleries. 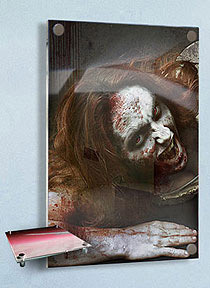 Your print will look absolutely breathtaking if you mount and frame it. Supplied rolled in a tube. Please note we do not offer framing and we recommend that you take your fine art print to your local picture framer. 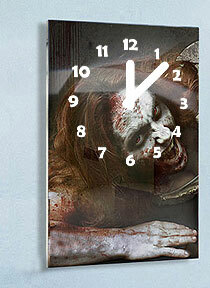 You can enjoy a truly horrifying time with your chosen image on one of our stunning wall clocks. Set onto a rectangle size clock face 12in x 16in (approx 300mm x 400mm) and supplied ready to hang. Requires 1x AA battery (not supplied). High resolution digital file suitable for print and quality reproduction purposes. High resolution files for print use: May be printed by you or printed via a professional establishment for your own exclusive personal use only (for example a print for your wall or a T-shirt, mug, etc). It may not be published in any manner, either in books, magazines, leaflets, advertisements, online or any other mass-produced or digital media without express written permission of Horrify Me. Our images may not be sold on to third parties under any circumstances whatsoever.